Are you ready to join in the fun? The Arcimoto Manufacturing Plant (AMP) Grand Opening Celebration is this Saturday, November 11. If you want to attend and have not already RSVP’d, please do so at https://www.arcimoto.com/amp. You will receive a confirmation email which includes the address of the facility, and we will be sending out an email with additional details to attendees on Thursday, so keep an eye on your inbox. If you can’t make it, we will be live streaming Mark’s comments (look for the link on our social channels), and will be recording video throughout the event that we will publish later. Hope to see you there! Speaking of the party, our first major piece of manufacturing equipment is scheduled to arrive on Friday, just in time for you all to lay your eyes on it. 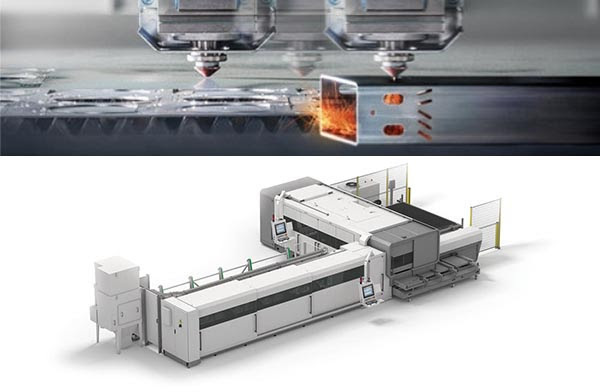 It is the BLM LC5 Tube and Sheet Laser, affectionately known by the team as the “BFL.” It integrates several fabrication operations (sawing, grinding, punching, drilling, machining) into a single step, allowing us to cut both tube and sheet metal vehicle parts. When combined with the E-Turn52 Tube Bender, an all-electric right and left hand CNC tube-bending machine and Bystronic Xpert CNC press brake headed to us straight from FABTECH, along with a handful of robot arms for material handling and welding, we’ll have tightly-automated frame and chassis manufacturing cells operating by early next year. These production investments were originally outlined as a part of Phase 2 of Arcimoto’s scaling plan, but we were able to get a jump start due to the strong success of our Reg A+ IPO. Once again we have you, our many supporters and investors, to thank for the boost to Arcimoto’s acceleration. That’s right… we’re about to get on the road again. Directly following the Press Start! celebration, we’ll make a quick stop in Portland to keynote Venture Community Northwest, followed by LA CoMotion later in the week, “an expo and festival on new mobility like no other.” Mark will be paneling alongside leading transportation officials from Paris, Copenhagen, and London for the “Treading Lightly: Clean Transport for our Urban Future” discussion that closes out the day next Friday the 17th, and the alpha vehicles will be on display and available for test drives for the public weekend November 18 and 19. After Thanksgiving, we’ll be heading back down to LA for Arcimoto’s inaugural appearances at the LA Auto Show and the LD Micro Main Event.